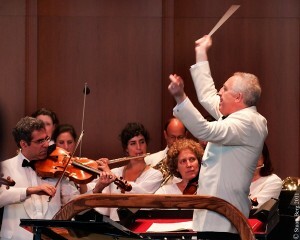 The first of two concerts at the start of each summer hosted by conductor Bramwell Tovey, the 4th of July Summertime Classics concert consisted of appropriately American music – Copland, Bernstein, Sousa and the U.S. Coast Guard Band under the direction of Capt. Kenneth W. Megan. The program opened with Copland’s Four Dance Episodes from Rodeo and Tovey’s The Lincoln Tunnel Cabaret featuring Principal Trombonist, Joesph Alessi. I loved the Copland, but the Tovey was nonsense. The second half featured the Coast Guard Band performing various marches and a band composition by Kenneth Hesketh called Masque and a Clare Grundman arrangement of 4 songs from Bernstein’s Candide. The program ended with Sousa’s Stars and Stripes Forever. Tovey is a good host, full of humor and charm. I can see why the Philharmonic invites him back year after year.